Lee Blaney, assistant professor of chemical, biochemical and environmental engineering, has received a prestigious CAREER Award from the National Science Foundation (NSF) to advance his research on contaminants of emerging concern and their effects on the environment. 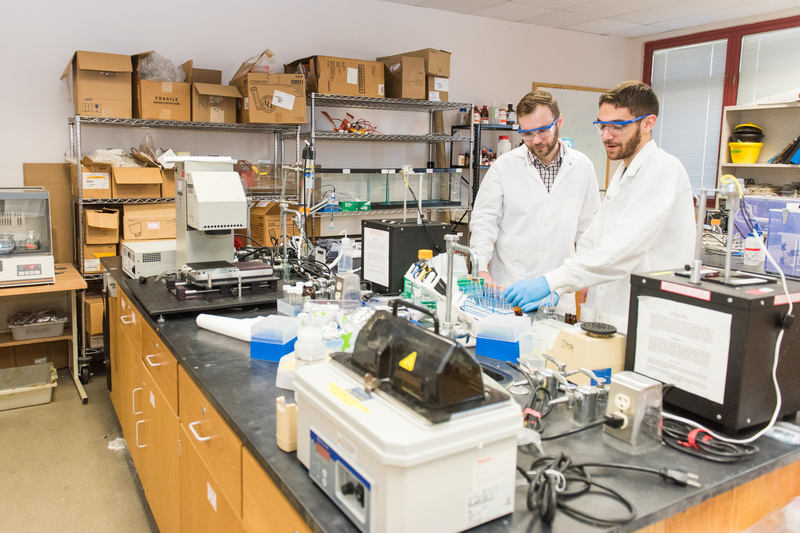 The grant, totaling $500,000 over five years, will support Blaney’s research on pharmaceuticals, hormones, and personal care products in the local Gwynns Falls watershed. “We congratulate Dr. Blaney on his NSF CAREER Award, a recognition of his commitment to impacting and engaging the UMBC and greater Baltimore communities through his research and teaching,” said Karl V. Steiner, vice president for research. Contaminants of emerging concern include pharmaceuticals and personal care products, such as antibiotics, hormones, sunscreens, and fragrances. Sewer leaks can introduce these everyday chemicals to urban streams, contaminating the environment. Recently, the American Society of Civil Engineers gave wastewater systems in the U.S. a grade of “D.” Blaney explains that it is crucial for these systems to be upgraded to maintain water quality and protect the environment. Lee Blaney, and Daniel Ocasio ’17, chemical engineering, working in the lab. Blaney will use screening tools that identify the presence of wastewater in urban streams to locate sewer leaks that may be adversely affecting streamwater quality and that require repair. In waterways affected by wastewater, contaminants of emerging concern have already been detected in the tissue of both vertebrates and invertebrates, highlighting potential concerns to human and ecological health through antibiotic resistance, endocrine disruption, and other toxicity mechanisms. This CAREER award also recognizes Blaney’s commitment to increasing the number of women and underrepresented minority students in environmental engineering research through collaboration with UMBC’s Center for Women in Technology, Meyerhoff Scholars Program, STEM BUILD Program, and programs supporting community college alumni completing their undergraduate degrees at UMBC. In addition, Blaney will develop and launch a citizen science program in Baltimore City to increase opportunities for community members to connect with their environment, collect important environmental data, and increase their scientific literacy. UMBC faculty have received 34 NSF CAREER awards since 1995 across a number of fields, including engineering, physics, information systems, and computer science. Header image: Lee Blaney. All photos by Marlayna Demond ’11 for UMBC.